Miami is pretty easy to get to these days – cheap international flights, a glut of hotels means great discounts, and of course with great weather apart from the pesky hurricane, what’s not to like? But with the glitz and glamour scene just around the corner, going out on the town in Miami can become an expensive affair. Here are some tips and suggestions for getting around on the down low. The Miami Art Museum is free on Sundays and the second Saturday of the month. No excuses but you do have to get out of bed. I’ve not been, sadly, but I hear rave reviews of the Gables Art Walk, which is the first Friday of every month from 7-10pm. Free art, transportation, wine, and cheese – what’s not to like? On Sunday, after you’ve hit the art museum, you might want to visit the Biltmore Hotel, famous for its line-up of former celebrity guests. They offer free guided tours on Sunday afternoons – check in advance to confirm times. 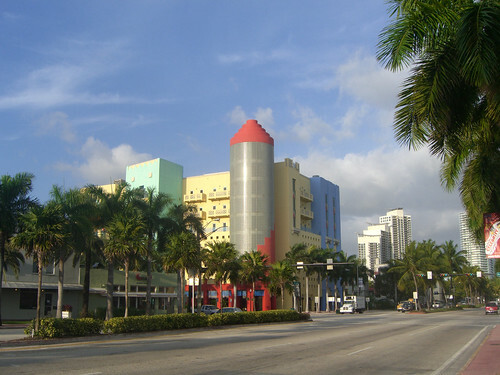 Lastly, the wonderful art deco architecture of South Beach is free; in a one-mile radius from South Beach proper there are more than 800 art deco buildings. Bring your camera! Cuban Food is one of my favourite cuisines, and here in Miami you have some of the best you can get without going to Cuba. Best part? It’s cheap. You can really skimp by just going to one of the many Cuban food carts that dot the city; just have a look at the queues and if there are folks there, you’re onto a good one – especially if other cubans are there too! There’s nothing like enjoying a freshly fried plantain or a fresh sandwich while watching the waves lap at the ocean. It might not be glitzy cocktails and fashionable china, but I’m totally ok with that. Being on the tip of a peninsula in the ocean has its advantages, the outdoors being one of them. Many beaches are free in Miami, though you’ll probably want to make a quick grocery or convenience store stop for snacks and sodas. But don’t forget other outdoor features in the city. Biscayne National Park is popular for scuba and snorkel, as well as exploring their famous mangrove forest. There is also the Ichimura Miami-Japan garden, a wonderfully peaceful place, perfect for reflection and relaxation if you need a break from the direct sun. What’s your favourite free/cheap things to do in Miami?